Some of the strangest tropical fruits are available during the summer. One of the biggest and most unusual looking is jackfruit. It is as large as a melon or bigger, mostly oval in shape, and has knobby or spiny green skin. The typical size at market is 20 pounds, but they can get as big as 60 to 80 pounds. It’s commonly sold cut in chunks. Grower Robert Barnum has about 200 jackfruit trees at his Possum Trot Tropical Fruit Nursery, interplanted with other trees on his 40 acre property. We strolled through a section of a dozen tall trees, all loaded with large fruit which varied in shape and size, some smaller and rounder, others more elongated. You can tell when a fruit is ripe because it sounds like a drum when you thump on it. Another clue is that its spines flatten out as it ripens, although that isn’t the best indicator, because some varieties have flatter spines than others. But the best way to tell ripeness is by smell. Ripe jackfruit has a strong aroma and gives off a lot of ethylene gas. If you put a whole ripe fruit in a refrigerator, it will keep ripening, and the whole interior will smell like it. Opening up a such a large fruit is not a casual undertaking. It requires stamina and patience, and a large sharp knife well coated with vegetable oil. The fruit’s thick rind releases a latex sap when you cut into it, and can gum things up. 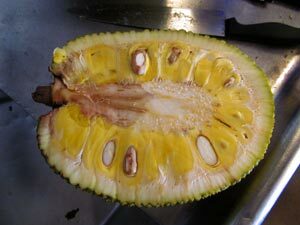 The edible part of the fruit is the aril, or thick sac of chewy yellow flesh that has an oval, shiny brown seed inside. The grayish-colored connective membranes called rags are generally not edible and need to be removed. Cleaning the fruit involves taking out the arils, and separating the seeds. Rags and rind are thrown away. Depending on the size, the job can take a good hour or more. Cleaned fruit will keep 2-3 weeks in a zipper bag in the refrigerator, or 6 months in the freezer. Jackfruit vary in the texture of their flesh. Some kinds are soft and wet, suited for making drinks, and others are more firm and dry. Those kinds are more desirable because they can be eaten ripe or unripe. Robert says the ripe fruit tastes like pineapple-banana with hints of vanilla, but I can smell and taste a musky overtone. (Others have told me the flavor reminds them of Juicy Fruit gum.) Unripe fruit is has a chewy texture, and is usually cooked and used as a meat substitute. Jackfruit curry is a popular dish made with unripe fruit, as is fake pulled pork seasoned with BBQ sauce. Seeds are also edible. Robert recommends blanching seeds in boiling salt water three times to remove the astringent flavor, then roasting in the oven. They taste a lot like chestnuts. You can save seeds to grow your own tree, but you’ll have to be patient. 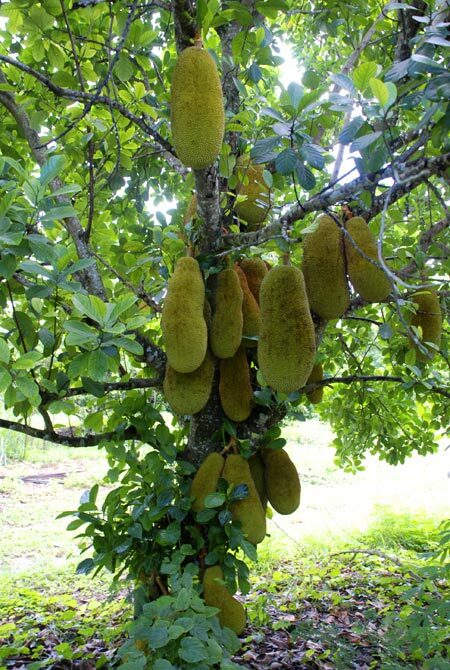 It takes anywhere from four to 15 years, depending on the variety, before a jackfruit tree starts to bear fruit. You can find whole and cut jackfruit from Possum Trot at the Upper Eastside Farmers Market, Verde Gardens Farmers Market, and at Bee Heaven Farm’s online store. 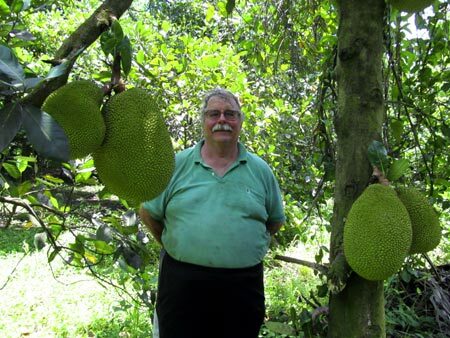 Robert Barnum and jackfruit tree. wowzy Jackfruit! great photo. thanks for article. always uplifting. mushy(soft ) type of fruit blend to sa smooth puree for cakes and smoothys.